Anaerobic digestion involves several successive stages of chemical and biochemical reactions involving enzymes and a mixed culture of microorganisms. The process comprises three general degradation phases: hydrolysis, acido-genesis, and methanogenesis. Figure 5.1 is a simplified representation of the reactions involved in anaerobic digestion. 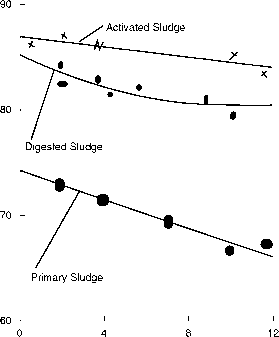 Figure 5.1 Schematic of reaction in anaerobic digestion. In the first phase of anaerobic digestion, hydrolysis, complex organisms such as carbohydrates, proteins, and lipids are converted to their soluble forms and hydrolyzed further to simple monomers. In the second phase, acidogenesis (also known as fermentation), acid-forming bacteria convert the products formed in the first phase to short-chain organic acids: primarily, acetic, propionic, and lactic acids, and hydrogen and carbon dioxide. In the third phase, methanogenesis, methanogens convert the volatile acids to methane and carbon dioxide. Hydrolysis is the rate-limiting step in the acid-forming phase (Eastman and Ferguson, 1981). After the solubilized organics are formed, they are converted immediately to volatile acids. The acid formers are primarily facultative bacteria. They are relatively tolerant to changes in pH and temperature. Facultative bacteria can also use dissolved oxygen during metabolism. Therefore, they can protect the methanogens, which are strict anaerobes, from the dissolved oxygen in the feed sludge to digesters. 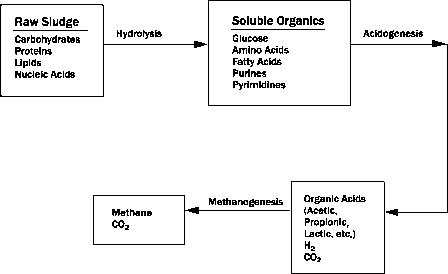 In an anaerobic digestion system, the acidogenesis and methanogenesis are in dynamic equilibrium; that is, after the organics are converted to volatile acids and hydrogen, they are converted to methane and carbon dioxide at the same rate at which they are formed. As a result, volatile acid and hydrogen levels are low in a digester that is working properly. However, methanogens are inherently slow growing, with doubling times measured in days. 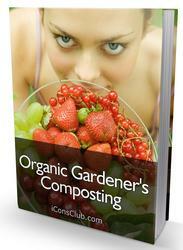 They can also be affected adversely by even small changes in pH and temperature. In contrast, acid formers, with doubling times measured in hours, can function over a wide range of environmental conditions. Therefore, when a digester is stressed by shock loads or temperature fluctuations, methane production lags behind acid and hydrogen production. When this happens, volatile acids and hydrogen cannot be converted to methane and carbon dioxide as rapidly as they form. Once the balance is upset, acids and hydrogen accumulate and the pH drops. As a result, the methanogens are further inhibited, and the system eventually fails unless corrective action is taken.